Ever listen to NPR's From the Top with Christopher O'Riley? An hour of interviews with and performances by highly talented and incredibly charming young classical musicians? Yeah, well, Lucy Beck-Moreau, the teenage concert pianist in The Lucy Variations by Sara Zarr, is never going to be a guest on that program. 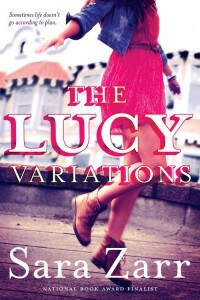 Lucy is getting ready to perform in an international music competition when she walks away because of a family crisis. The price she pays? Well, the music stops. The applause stops. The attention stops. There's a lot going on in this book that's familiar. The controlling grandfather. The mother who is trying to compensate because her own youthful career fizzled out. The well-meaning father who is too weak-willed to have an impact on his daughter's situation. What is different and striking is the music teacher, Will. He has the potential to be the stereotypical teacher who changes the protagonist's life. But he so isn't. The Lucy Variations is an engaging read, even for those of us whose experience with classical music is limited to listening to it on the radio. The book opens a door into a world where people find their passion early and are willing to train hard and long to serve it. And then there is Will.